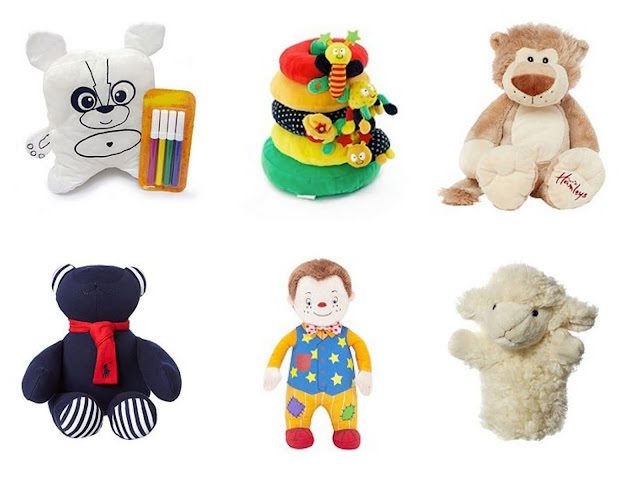 Kids: Soft Toy Wishlist with House of Fraser. Last month I brought you a toy wish list with House of Fraser in anticipation of the kids holidays, today I'm talking all things cuddly and quite apt actually because Pops is poorly today and nothing brings comfort like a cuddly toy, well apart from the cuddles of a loved one possibly, but soft toys are a pretty close second! 1. Jacks Doodle Buddy - I love the interactive element of this, Poppy loves designing toys and clothes and this makes that a reality! 2. Baby Elegance Stacker - This is a great little educational toy for babies, soft to the touch but great for building hand/eye coordination. 3. Hamleys Lion Soft Toy - Well no explanation is needed really, it's just ruddy cute! 4. Polo Ralph Lauren Babys Plus Toy - I love this, it's got a real nautical feel about perfect for baby's nursery. 5. Something Special Mr Tumble Talking Soft Toy - This is such a cute take on this popular kids TV character, and is fully interactive. 6. Hamleys Lamb Hand Puppet - This last one is a bit self-indulgent, but as a kid my dad would do little puppet shows for me that would have me in absolute stitches, this little lamb just so sweet! I hope I've given you some inspiration if you have a new member of the family arriving soon, or a birthday coming up! Or if you're super organised you might even be getting some Christmas presents in! Small children like things that are soft and cuddly and parents have provided soft toys as obvious play choices throughout time. They can hold them close and cuddle them. This warmth offers the comfort and security often needed when children are tired or placed in a situation of needing to cope with change. Soft toys become close friends, providing love and stability.